Wardley House offers student accommodation in Bradford. Our student housing is situated in the heart of the city, minutes away from the University of Bradford and Bradford College. If you’re looking to live student life to the full, you’ll love Wardley House! Our great value accommodation includes all bills, free contents insurance and free 50MB Wi-Fi included in the weekly rent. There are also a range of payment instalments available to suit you. Find out more and book your room for only £1! You will be charged a £1 booking fee at the time of accepting your offer. Once the payment is made, this is non-refundable. Call us on 0300 123 5050 or contact us if you would like to live in one of these flat types or want to find out more. Yes that's right, a whole double bed all to yourself! Let's play! Live BT Sport, games machines and table sports are available in the common room. You're protected by contents insurance from Cover4Students which covers your possessions for free. Super-speedy WiFi in your bedroom and throughout the building means you’re always connected. You’re safe and sound with our 24 hour on-site security and CCTV. Sanctuary Students Wardley House is located above the National Media Museum in the heart of Bradford, just a few minutes’ walk from both the University of Bradford and Bradford College. This accommodation has 290 rooms, so you’ll be sure to meet plenty of other students. Flats are available with either three, four or five bedrooms, and all rooms are en-suite with double beds. 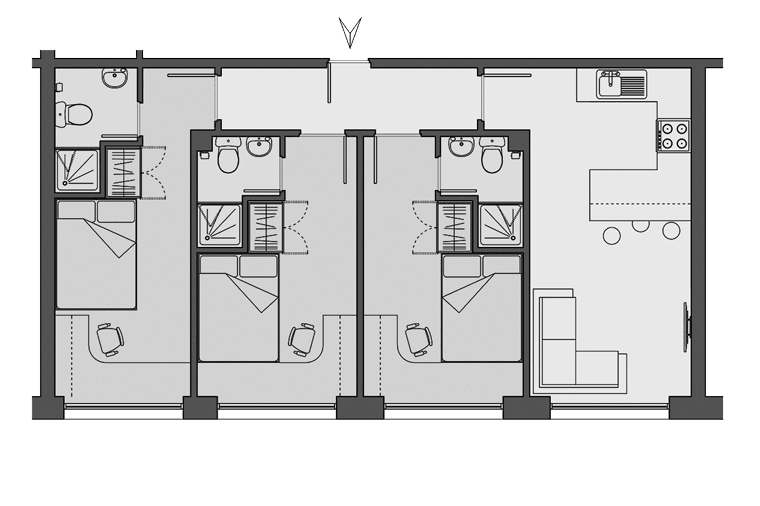 Each flat comes with a fully-fitted kitchen and lounge area with a leather sofa and flat screen TV – the perfect place to cook, relax and have fun. This accommodation has building wide Wi-Fi and high speed broadband to keep you connected. Other top features include a large common room with a pool table, flat screen TV and live BT Sport - the perfect social space. We also provide on-site management, maintenance support and 24 hour on-site security. We provide fantastic rental packages which include all utility bills, contents insurance, and there are flexible payment terms to suit you. If you’re looking to live student life to the full, you’ll love Wardley House. Contact us at Wardley House to find out more. Wardley House is in a great city centre location above the National Media Museum. The city centre, local convenience stores and Kirkgate Shopping Centre can all be reached in just over five minutes. A number of popular student haunts, including restaurants, takeaways and bars, can be found just around the corner. 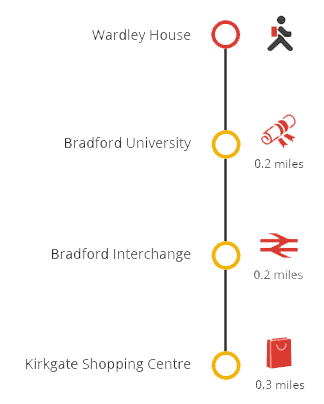 For transport links to London, Manchester, Birmingham and beyond, the Bradford Interchange is just 10 minutes away. Both the University of Bradford and Bradford College can be reached within 10 minutes, making Wardley House the ideal location for students looking to enjoy all that Bradford has to offer. Please contact us in advance to let us know what time you will be arriving at Wardley House. You can email us on Wardley@sanctuary-students.com. When you arrive please come to reception at the front of the building where we’ll be able to hand over your keys to you. Please make sure you bring some photographic ID, either a passport or driving license, so we know who you are. Let us know beforehand if someone else is going to be collecting your keys for you. If you know you’re running late, please let us know by giving us a quick call on 0870 600 4777, option 6. If you arrive between 5pm and 8pm we won’t be able to give you your keys but if you let us know in advance, we can arrange for your keys to be left with our security guard from 8pm. There aren’t any parking facilities or drop of bays at Wardley House but we do have some luggage trolleys available that you can use to move your belongings. Please use local car parks and collect your keys before you start unloading your car. The University of Bradford offers loads of information on student life in Bradford. Wardley House now benefits from LaundryView which will make doing your laundry on-site even easier. The system, created by Circuit, allows you to go online and check the availability of washers and dryers in your building as well as see when other washes are about to end.